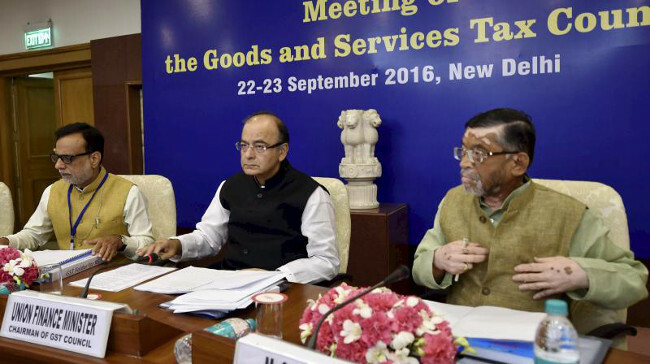 A Goods and Sales Tax Council meeting on Saturday failed to reach any consensus on the approval of the drafts of the Central Goods and Services Tax and State Goods and Services Tax. “On duel control there is no consensus so far. It will be taken up tomorrow,” Jammu and Kashmir finance minister Haseeb Drabu told reporters after the meeting, and also expressed hope that April 1 target for the GST roll out is possible. Finance Minister Arun Jaitley stressed on the point that the Goods and Services Tax has to roll out before September 16 next year as the existing indirect taxes will come to an end by then and it would not be possible to run the country without revenue collection. He advocated for widening the tax base, saying efforts are on to make taxation process far simpler and make rates more reasonable. For instance, he said, the GST Council is deliberating on ways to reduce the taxation process, including assessment by tax officials.